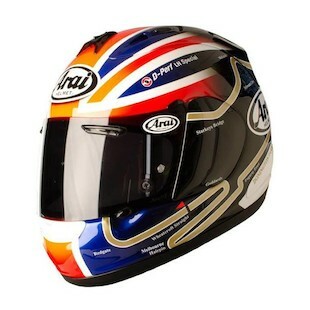 New Arai Corsair V Haslam Track Helmet! One of the most beloved racing and track day helmets is the Arai Corsair V, entrenched in racing heritage atop the heads of some of the best riders. Since we all know adding graphics immediately shaves off 3 seconds from your lap time, this surprise release from Arai should give you a nice edge for the remainder of the season! Ron Haslam was a British Motorcycle racer in the 1970s and 1980s, leaving his mark in World Superbike, MotoGP, Macau, and even Isle of Man TT. No matter where he rode, Haslam was damn fast, racking up a plethora of titles over his career. The Arai Corsair V Haslam Track Helmet is a tribute to his speed and commitment to the sport over several decades. Ron now heads up the Haslam Race School at Donington to pass on his experience and respect for two-wheel racing to the next generation. You'll notice that the Haslam Track Helmet is cleverly designed with both the Silverstone (rider's right) and Donington Park (rider's left) track maps. 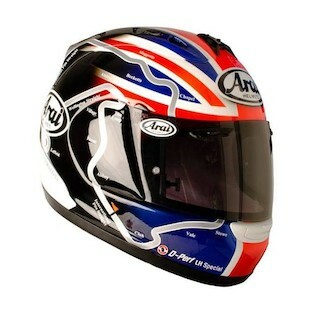 Weaving each famous turn in with the flag of Great Britain, this helmet is chocked full of racing history. We would expect you to see an additional second of laptime advantage when racing the Haslam Track helmet at Silverstone and Donington Park. While you are there, stop by Haslam's farmhouse in Derbyshire and have a cup o' tea.